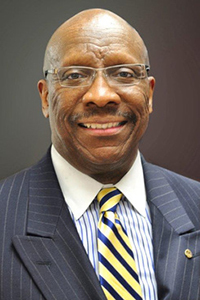 The Honorable Gerald Bruce Lee of the US District Court for the Eastern District of Virginia is the recipient of the 2016 Virginia State Bar Diversity Conference’s Clarence M. Dunnaville Jr. Achievement Award. Lee is being honored for fostering, encouraging, and facilitating diversity and inclusion in the bar, the judiciary, and the legal profession. Lee lives by his motto, “To whom much is given, of him much is required,” though he began his life in the public housing projects of Southeast Washington, DC, where his first job was as a street sweeper. After receiving a scholarship to attend the American University, from where he graduated in 1973, Lee went on to receive a law degree from American University’s Washington College of Law in 1976. Lee worked as a successful civil and criminal lawyer for fifteen years before beginning his judicial career when he was elected to the 19th Judicial Circuit, Fairfax, in 1992. He was appointed to the Eastern District in 1998, after being nominated by President Clinton, with bipartisan support and the highest rating of each of the twelve bar associations that evaluated him. Throughout his career, Lee has sought to give back to the legal community. Upon graduating law school, he co-founded a program that helped minority attorneys advance their careers, and today he works with the Just the Beginning Foundation to create the Share the Wealth program that places hundreds of under-represented minorities in federal clerkships. Thus far, four of his participants have been elevated to the bench. Additionally, Lee launched a Just the Beginning program that has helped more than 300 diverse law students find summer employment in judicial chambers nationwide. Lee also volunteers as a counselor and speaker at Kamp Kappa, a program to help educate and inform boys ranging in age from 10 to 16 about the justice system, and to help create interest in legal careers. Because of his devoted years of service as a volunteer, an educator, and a role model, Lee has received numerous awards including The Lodestar Award for mentoring from American University, the Distinguished Service Award from the Virginia Commission on Women and Minorities in the Legal Profession, the Fairfax County Human Rights Commission Human Award, the Asian American Bar Association Award, the Medgar Evers Award from the National Association of Blacks in Criminal Justice, the Ollie May Cooper Award from the Washington Bar Association, and the Oliver Hill/Samuel E. Tucker Lifetime Achievement Award from the Old Dominion Bar Association. The Clarence M. Dunnaville Jr. Achievement Award will be presented June 17 during the Virginia State Bar Annual Meeting in Virginia Beach.